In the Barre Chords 1 and 2 lessons you learned about Major barre chords. Now that you understand barre chords and the diagram I use to display them, it is time to look at Minor barre chords. You will be learning two chord shapes based on the open E minor chord and the open A minor chord shapes. 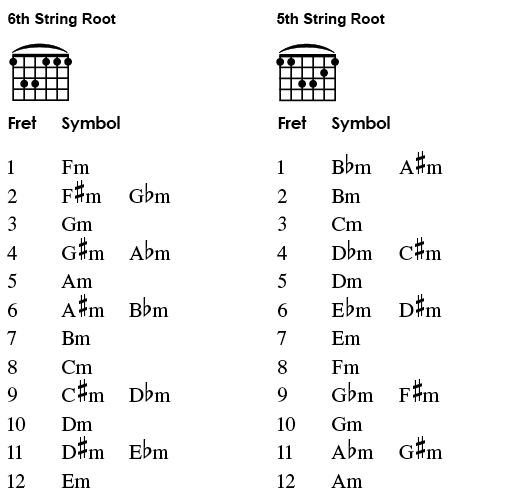 The Em shape barre chord has its root on the 6th string and the Am shape barre chord has its root note on the 5th string. Here is a chart showing two types of Minor barre chords. One with its root note on the 6th string is based on the open Em chord shape, and the one with its root note on the 5th string is based on the open Am chord shape. Play this progression that uses 6th string root barre chords. Now here is a progression with the same rhythm using 5th string root barre chords.